Formula 1 1998 – Tower Wings Banned becuase they were too Ugly | 2012 – Are step noses are just as ugly – will they be banned after the season? During the 1995 Formula 1 season tower wings ( mini wings – winglets ) were all the rage, but with two problems. The main problem was that they were just plain UGLY. The other problem being they might not be safe, and that was the reason given for banning their use by the FIA. 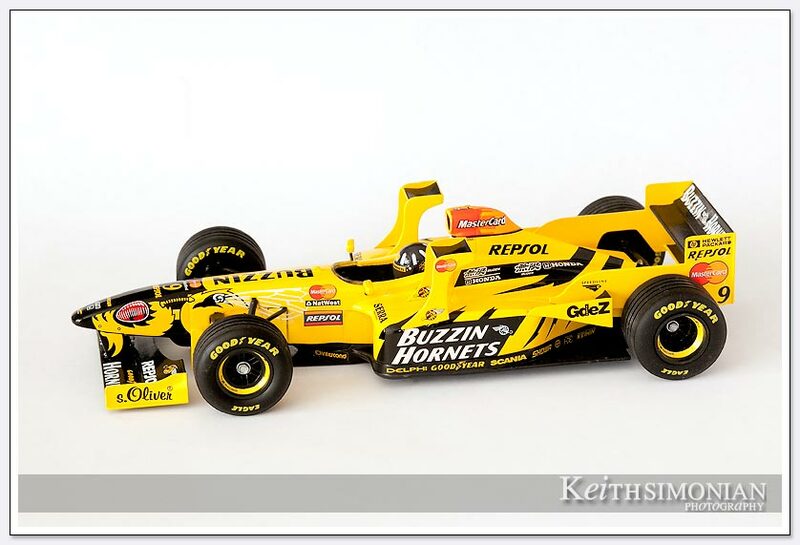 This 1/18 model scale car is the 1998 Jordan Mugen Honda 198 driven by Damon Hill with the Tower Wings. Hill drove the #9 car to a 6th place finish during the 1998 season with a total of 20 points scored. The car sports it’s non tobacco livery of Buzzin Hornets which is a take off of the tobacco livery sponsor Benson and Hedges cigarettes. The 1994 San Marino Grand Prix in Imola, Italy saw the tragic death of Ayrton Senna, the driver considered by most to be the best ever. That day at Imola Senna was driving the Williams-Renault car when he lost control at the Tamburello corner. 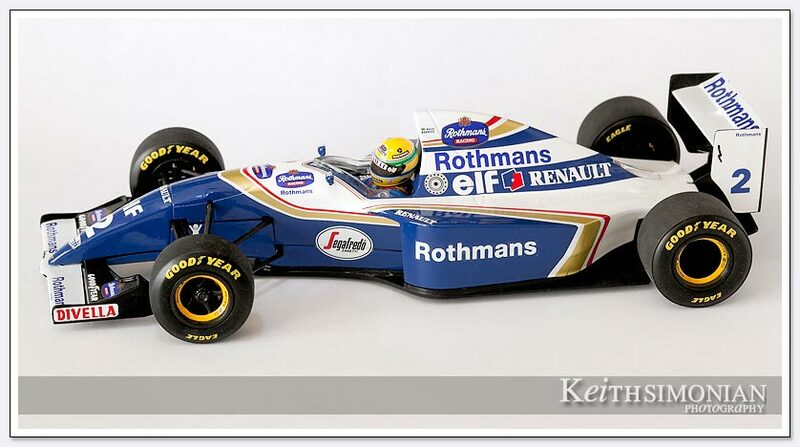 The number 2 car is shown with after market decals with Rothmans livery as it was on the car during Senna’s last drive. 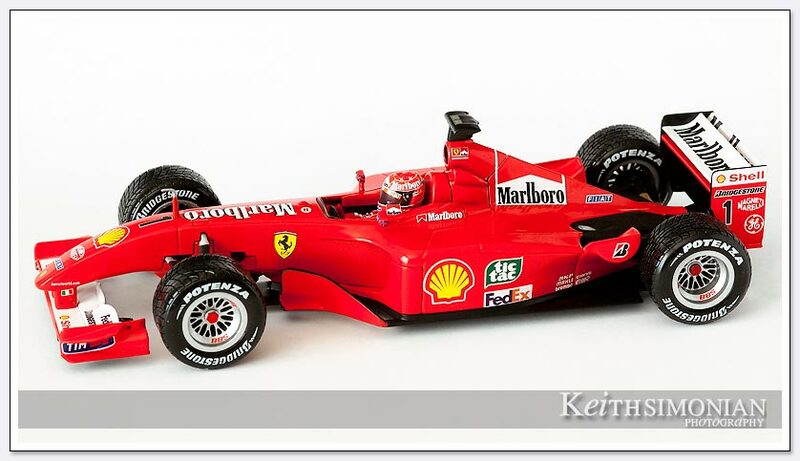 The Ferrari F2001 was driven by Michael Schumacher to the FIA world driver’s championship with 9 race wins during the season and a total of 123 points out pacing the 2nd place finisher in the championship David Coultard with 65 points. The car shown is the “King of the Rain” modelÂ which features Bridgestone Potenza rain tires and after market decals which show the tobacco livery the car raced with. Ten years later in the 2011 Canadian Grand Prix Michael showed he was still master of the wet by finishing 4th in out matched Mercedes race car. 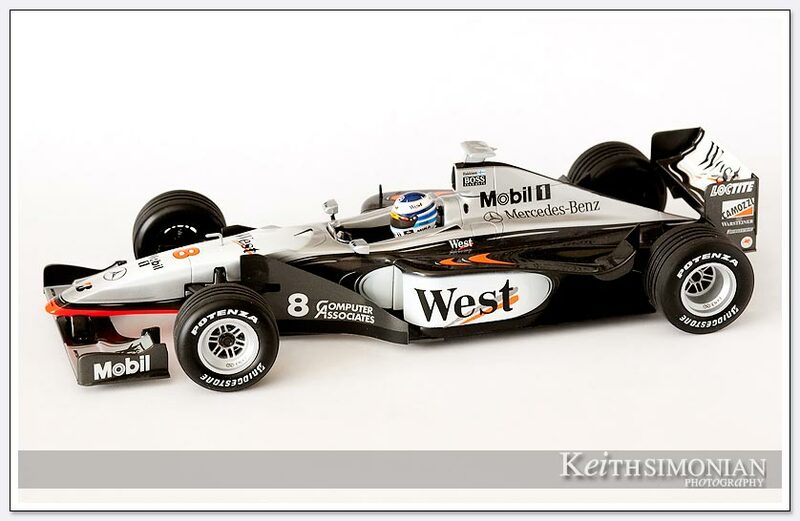 Mika Hakkinen drove the #8 West McLaren-Mercedes Adrian Newey designed car to his first of two FIA world driver championships. MichaelÂ Schumacher was the runner up that year with 80 points to Hakkenen’s 100 points. The MP4-13 McLaren featured a 3.0 liter V10 engine which helped the team to also claim the 1998 Formula 1 Constructors championship. 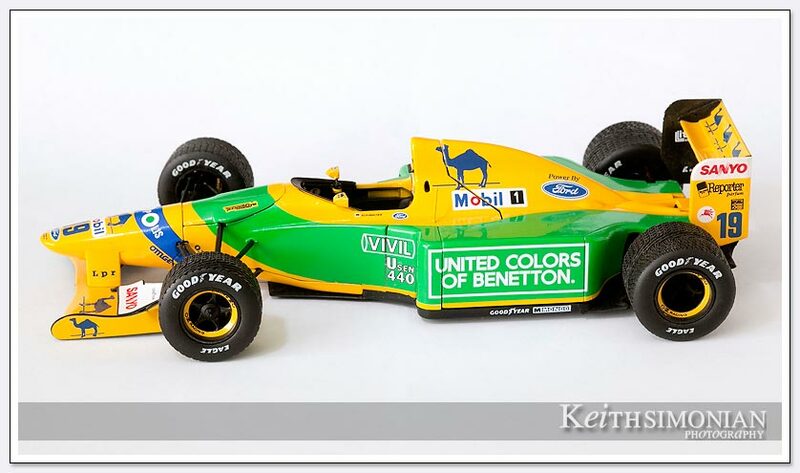 The 1992 Benetton – Ford #19 car is shown in it’s Belgium Grand Prix configuration with rain tires that helped Michael Schumacher win his first race ever at the Spa-Francorchamps track which featured rain during the middle of the race. 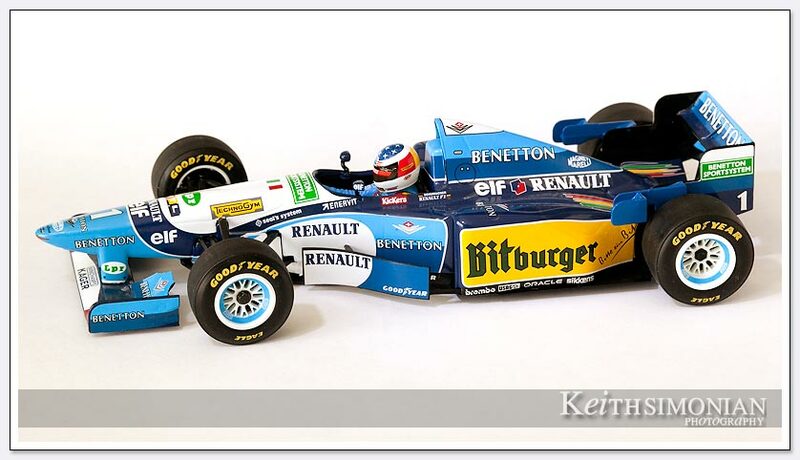 This Paul’s Model Art 1995 Benetton Renault B195 was the first Michael Schumacher car to have the Number one as he had won the drivers’ championship the year before. The car shown is as it was raced in the German Grand prix with rain tires and Bitburger livery. Schumacher would capture his 2nd FIA World drivers championship by scoring 102 points over 2nd place driver Damon Hill who finished the season with 69 points. Michael Schumacher drove the 2002 F2002 Shell-Vodafone Ferrari to his 5th World Drivers’ Champion tying the number of championships that Juan Manuel Fangio has. 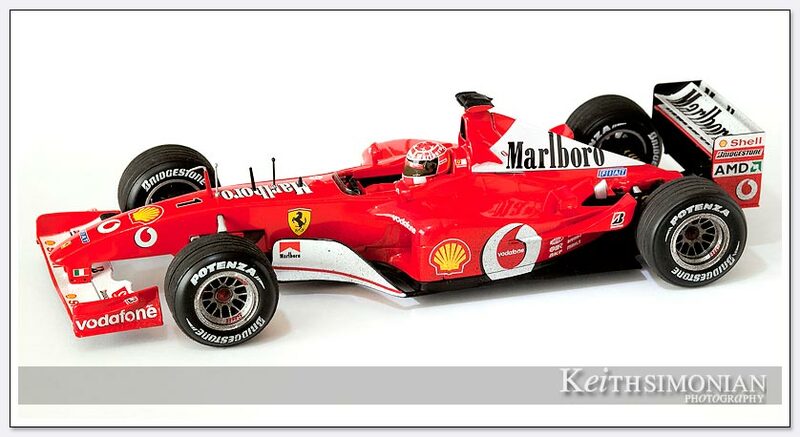 The 1/18 scale modelFerrari is show with it’s full Marlboro livery and simulated race condition dirt. March 16, 2012 Update – It’s official, even the FIA don’t like the design of the new step noses. With all the F1 teams in Melbourne Australia for the 2012 season opening race at Albert Park circuit, FIA race director Charlie Whiting revealed that he hopes the teams have “nicer” front noses by the 2013 season. He added, had the FIA know how the front noses would have turned out under the current regulations, those regulations might have been changed. Mr Whiting, it’s called the rule of unintended consequences. The 2012 F1 season opener will take place this Sunday at the 5.3km Albert Park Circuit which has a lap record of 1.24.125 seconds set by seven time world driving champion Michael SchumacherÂ during the 2004 race.